It’s the lazy plot device and overblown concept used in sci-fi stories for decades: the virtual reality avatar fully equipped with all of the human senses. Used recently in the big-budget James Cameron flick Avatar, the idea of the super-advanced virtual character has always been way outside of the reach of actual technology. But since we live in the totally amazing future, researchers have now developed a method that allows monkeys to move virtual arms with just their minds – and feel sensations through those virtual limbs. The development is known as a brain-machine-brain interface. Scientists have been working on just such a system for many years in a bid to help paraplegics and people with locked-in syndrome interact with the world. This experiment, performed at Duke University, equipped monkeys’ brains with hair-like filaments. 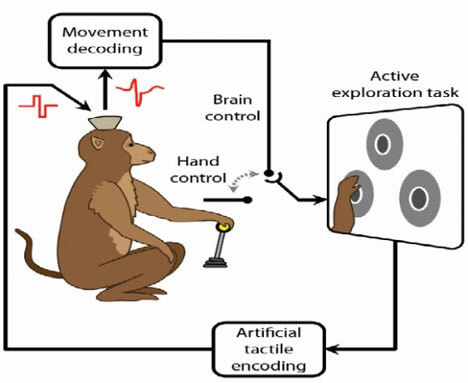 While watching a virtual arm on a screen, the monkeys learned to control the arm and correctly identify a target based on artificial tactile sensation received through the brain implants. 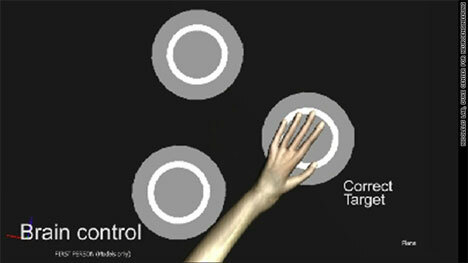 In other words, the monkeys could “feel” textures through the virtual arms. In the Duke experiment, one monkey correctly identified the target object based on texture alone about 85 percent of the time. Another monkey got the right answers about 60 percent of the time. Although still several years in the future, the ultimate goal of the researchers is to combine a brain-machine-brain interface with a robotic exoskeleton that will allow paralyzed patients to not only walk, but to feel the world around them in vivid detail. But being the nerdy dreamers that we are, we envision a future in which monkeys will control all machines with their newly-acquired cybernetic brain implants.